CADRE is happy to welcome a new cohort of DRK-12 awardees. The new projects are already represented on the CADRE website. We invite you to explore! CADRE is one of the new DRK-12 awards! We are enthusiastic to begin a new year of providing support to the DRK-12 program, and helping to make connections among awardees, their work, and those who might benefit from knowing more about that work. Our activities will include, but aren't limited to, characterizing the DRK-12 portfolio, featuring DRK-12 products and findings, supporting early career researchers, and organizing a PI meeting for networking and collaborating. We invite your input as we begin to plan the 2018 DRK-12 PI meeting—to be held June 6-8 in Washington, D.C.—and other activities. Keep an eye on your inboxes for a survey from us in the coming weeks that will help inform our programming. And, of course, we welcome your suggestions at any time. Congratulations to all recently announced DRK-12 awardees! We look forward to getting to know you and hearing about your work as it progresses. Welcome to our community! In an effort to help cadrek12.org visitors learn about funded work, CADRE has been collecting project keywords from active awardees. The live results for the 2017 awardees are available here. In this webinar, NSF Program Officer Rob Ochsendorf will introduce DRK-12 awardees to the ins and outs of managing your NSF project. The discussion will include expectations around evaluation and reporting, advisory boards, Institutional Review Boards (IRB), NSF Highlights, and more. There will be time for attendees to ask questions. On August 31st and September 11th, NSF's Dr. Rob Ochsendorf led two informational webinars on the 2017 DRK-12 Program Solicitation. The slides, recordings, and NSF responses to additional participant questions are available on the CADRE website. In addition, CADRE's NSF Proposal Toolkit has been updated with additional resources, including Tips for Developing NSF Proposals from the CADRE Early CAREER Guide and new Dear Colleague Letters. CADRE has also summarized changes to look for in the new 2017 solicitation. 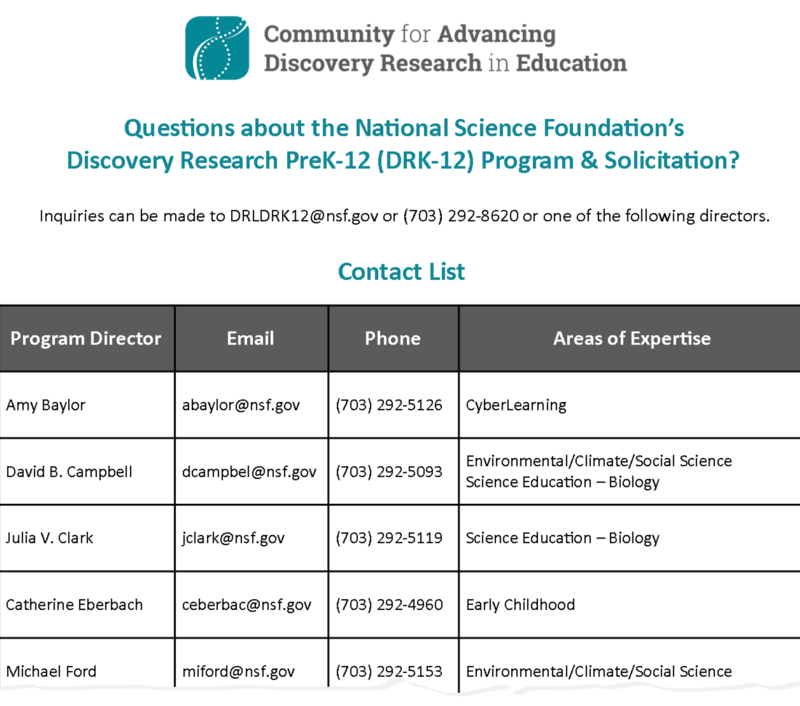 If you have a question for an NSF program officer, click the image below for a full list of DRK-12 contacts and their areas of expertise. 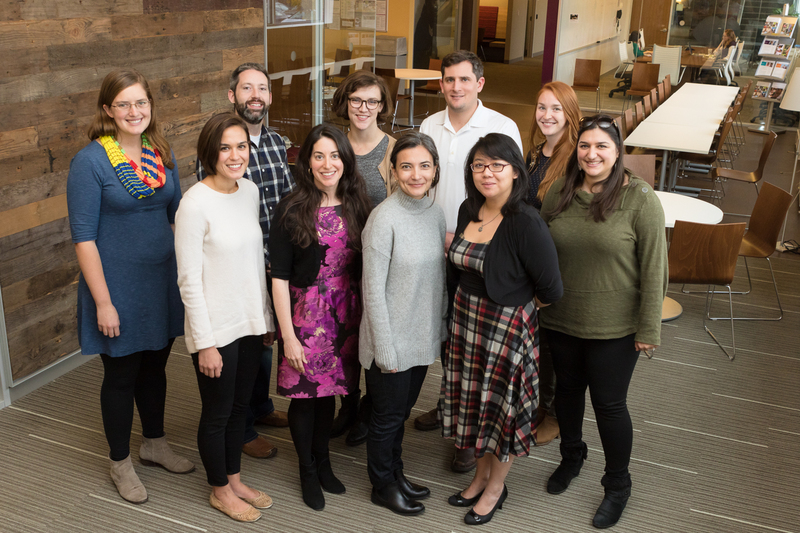 CADRE invites you to nominate a member of your project team who might benefit from the professional growth opportunities provided by the CADRE Fellows program. Through collaborative activities, thematic webinars, and attendance at the 2018 PI meeting, Fellows will have an opportunity to expand their professional networks and learn more about what it takes to become a successful STEM education researcher from a variety of perspectives. We aim to establish a cohort of 10 Fellows with diverse backgrounds, experience, interests, and professional goals. Special consideration will be given to projects, awardees, and institutions that have not previously had a CADRE Fellow. Please note that we will accept only one nomination per project per year. Be a doctoral student or other early career professional at either an academic or non-academic institution. In very special cases, we will consider postdocs. Work on an active DRK-12 project, with at least one year of experience on the project, and be nominated by their PI or Co-PI. Have research experience in education and exhibit evidence of leadership and academic success. Demonstrate the desire and potential for advancing STEM education in meaningful ways. Have professional experience and/or career goals that contribute to broadening participation in STEM education. Be able to commit to and contribute to the Fellows program. Applications are due by 5:00 PM EST on September 25, 2017. The new Fellows cohort will be announced on October 6, 2017. CADRE Fellowship Alumni: Where are they now? As the CADRE Fellowship enters its eighth year, we continue to survey our alumni network to learn where they are in their careers. Read the Fellows alumni profiles to learn about their current work and research interests. If you are a Fellowship alumnus and would like to have your profile added or updated, please email cadre@edc.org. CADRE regularly updates lists of upcoming STEM education-related conferences (featuring dates, session proposal information, etc.) as well as publication opportunities (featuring submission guidelines, target audience, etc.) that may be of interest to DRK-12 awardees. The most up-to-date lists can always be found on the CADRE Events page. Blog | In this EdWeek blog, Bill Penuel answers questions on the Design-Based Implementation Research (DBIR) approach to partnership work. Publications | This NCTM compendium, edited by Jinfa Cai, shares "comprehensive evidence about what is known about research in mathematics education." In the News | TuftsNow interviewed Kristen Wendell about her work in engineering education. App | The Next Generation Preschool Math project released a new Gracie & Friend app focused on spatial thinking. Awards & Recognition | The EarSketch team was recognized for "making a difference in their introductory computer science classrooms through excellent and engaging curriculum." Blog | In a Tcher's Voice post, former CADRE Fellow Dora Kastel shared video examples of NGSS in the classroom. Publications | In this International Journal of Science Education article, Hyunju Lee, Max Longhurst, and Todd Campbell report on a two-year study of technology professional development for science teachers. Publications | In this Science Teacher article, Joe Krajcik describes three-dimensional instruction and how to incorporate it into a classroom. What Assessment Structures and Strategies are Most Effective at Improving Mathematics Learning? In an MSPnet blog post, Brian Drayton discusses Vygotsky's "Zone of Proximal Development" and the term's current usage in education spheres. View slides and listen to a recording of the August 24th, CAISE-hosted webinar to learn more about the AISL solicitation (due November 6). A complete archive of our newsletters is available on cadrek12.org.